The state encompasses the volcanic Hawaiian Island chain with hundreds of island covering some 1,500 miles. Long before it was a state of the United States, it was the Kingdom of Hawaii, from 1810 to 1893, an independent nation with diplomatic relations with other countries. The earliest possible settlers may have been the Polynesians people arriving from the Marquesas and the Society Islands of the South Pacific. Then, immigrants sailed from Tahiti to settle in Hawaii around 1,000 AD. For centuries the growth of inhabitants was slow, but fairly steady. The first Europeans to the Islands came with the English Captain James Cook, an explorer. He arrived in 1778 and named the island the ‘Sandwich Islands.” He returned again in 1779, but lost his life in a battle with the King of the Big Island and his warriors over a disputed boat. Yet, more Europeans, especially the English, continued visiting the islands as explorers and traders. When whaling became popular, so did the Islands because of its location for needed supplies. Many of the Europeans remained on the Islands and intermarried with the natives. With the foreigners also came infectious diseases which killed off many of the natives. Examining Hawaii genealogy, the first wave of immigrants coming from the main continent of Asia were several Chinese who came with the trading ships of the late 1700s. All the islands came under one monarchy by 1810 which helped end the fighting among various chiefs on different islands. Christianity came to the Islands in the 1820s by the numerous American missionaries coming to Hawaii. Various religious groups including Catholics, Protestants and Church of the Latter-Day Saints converted the Hawaiian natives. Japanese immigrates arrived on the Islands as laborers in the 1880s. From 1899 to 1902 some 5,000 residents from Puerto Rico came to Hawaii to work the sugar plantations. A few years later, emigrates from Korea came to work the fields. Additional Koreans arrived later in the 1960s. During the late 1800s the monarchy experienced various problems in management of the Islands. The population of European heritage had greatly increased, including Native Americans who had come to the Islands as businessmen. The monarchy was overthrown by the white population in 1893 and Hawaii became a republic, which lasted for four years. Many political leaders in the United States now were pushing for annexation of the Hawaiian Islands. It was approved by the U. S. Congress by 1898 making Hawaii with its hundreds of islands a territory of the United States. It would be decades before statehood came to Hawaii. It was admitted as the 50th state in August 1959. Since becoming a U. S. territory the population had increased from 154,000 in 1900 to 368,300 in 1930 to nearly 1.3 million in 2009. The U. S. military presence on the Islands for decades, keeps the military personnel approximately 1.3 percent of the overall population. 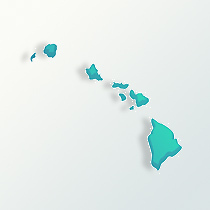 There are two official languages in Hawaii, that of English and Hawaiian. The largest ethnic groups represented in Hawaii are the Filipinos making up about 14 percent of the population. This is followed by the Japanese at 13 percent and the Polynesian cultural groups at 9 percent. Compiling all the Asian ethnic groups in Hawaii, they represent about 34 percent of all of Hawaii. The European ethnic groups represented are Germans, English, Irish, Portuguese, Italians and French. A significant number for Hawaii genealogy are some 13,000 natives of Portugal who come by 1899 to work the fields of Hawaii. The African-American population is about 2 percent. Most Hawaiians are Christians, followed by those who are Buddhists. Even with the mixture of cultures, Hawaii maintains it Polynesian traditions. They have their own music, clothing, dance, food, stories and historical traditions.